Women's Basketball Game: Oct. 23, 2017. Women’s basketball team loses to St. Philip’s College by 5 points, 77-72. The Rangers galloped away with a loss to the Lady Tigers Oct. 23 in the health and fitness center at St. Philip’s College. Throughout the whole game, both teams played top-notch competitive basketball with the first foul being called a minute into the first quarter. 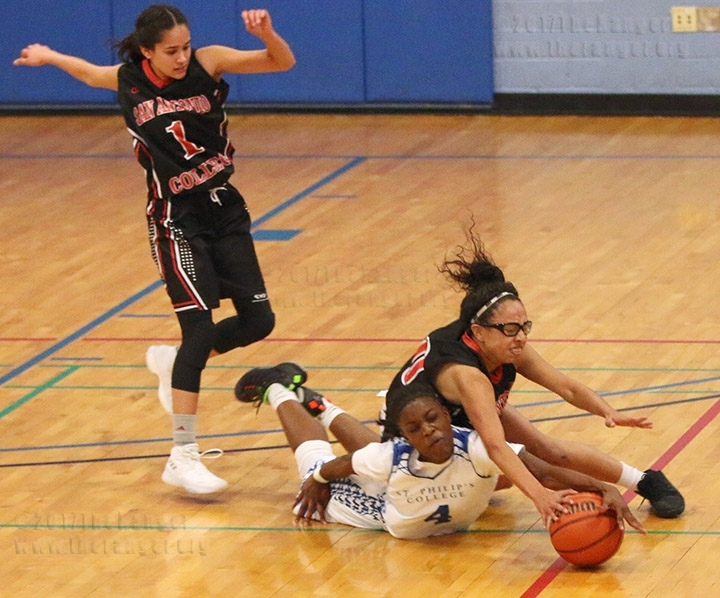 Kinesiology sophomore Destiny Solis fouled former Ranger basketball teammate now Tigers point guard, psychology sophomore Shanesha Clayton on her way up to the basket. Clayton successfully made the layup that resulted in an and-one. Slick and quick basketball moves such as reverse lay-ups and pump fake shots were coming from Solis and Clayton. Fouls kept coming with slipping and diving for the basketball, causing rough scuffling on the court from both teams. In the fourth quarter, kinesiology sophomore Kennedy McGovern defended the rim on the opposing team that resulted in rebounding missed shots to pass out to Solis. With 1:23 left on the clock, the Rangers trailed by 2 points, 72-70. McGovern scored 10 points for the Rangers. Clayton dominated all four quarters of the game with 39 points for the Tigers. Clayton was sent to the free-throw line four times in the fourth quarter. Clayton made 5 successful shots out of the 4 times at the free-throw line. Criminal justice freshman Alina Falcon contributed 29 points for the Rangers, 14 in the first quarter. The next home game will be against the Trinity Tigers at 6 p.m. Nov. 6 in Candler.